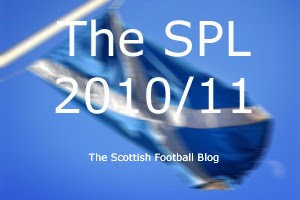 Week one in the SPL provided a fairly pleasant introduction to the season. Some good games, some decent performances and Hibs managing to distill a whole season’s worth of inconsistency into 90 minutes. I also discovered that finding a pub showing SPL games in Hartlepool is not that easy. Who knew, though, that a little corner of the North-East would boast such an impressive array of international satellite TV systems? If the alcopop swilling youths and hardened alcoholics of that town aren’t at least trilingual I’d be amazed. Actually Hartlepool reminded me of Scottish football a bit. At some time in the last 50 year an unknown force has decided to flatten the heart of the town and replace it with a bewilderingly dull series of interconnected shopping centres. The result leaves the unwitting consumer trapped in the middle, silently screaming "God help me, I want to get out." For some reason that put me in mind of chronicling the SPL. You can get a full round up of all last weekend’s action over on A Year In Scottish Football. Can we expect more of the same this week? I’ll jump ahead and begin with this one. I won’t be there. I had already booked tickets for a writer’s workshop at the Book Festival before I was aware of the fixture switch. I’d like to think that’s probably the most woolly, Guardian-reading excuse for missing a game that you’ll read this season. But my life is a picture of middle class excess so who can say I won’t trump it? Anyway. Hibs welcome Rangers and open the new East Stand. Delivered on budget and slightly earlier than planned. How often they will be able to fill it remains to be seen and depends largely on the team’s ability to build on last week’s winning start against Motherwell. Rangers offered up exactly the kind of workmanlike win against Kilmarnock that can end up clinching championships. So this will be an interesting one. We know Hibs can score goals and we know Rangers can be imposing in defence. But is the Hibs defence solid enough - Chris Hogg was coming in for major criticism from some of the fans I spoke to last week - and will Rangers introduce any of their new attacking options? Intriguing. Even when Hibs had pretensions of splitting the Old Firm last season, Rangers swatted them away at Easter Road. More of the same? Possibly but with a new stand to christen I’ll take a score draw. A win last weekend and a win in Europe and now a home game against a new look St Mirren. Not a bad week for Neil Lennon who knows that a decent start is crucial despite the revolving door of the transfer window (a bit of an architectural mixture-maxture that sentence actually). St Mirren were set up as whipping boys and then almost beat Dundee United so Neil’s namesake Danny will also be feeling a bit happier. Unfortunately for the Saints I can’t see them getting anything here. A one sided home win and a Celtic clean sheet. United got away with a 1-0 defeat to AEK Athens and can now turn their attention back to the SPL. A draw with St Mirren in their first outing won’t have been the start they were looking for and they’ll be wary of an Inverness side who did well for the first 45 minutes against Celtic. Will United be tired after their European exertions? At this stage in the season they really shouldn’t be. I think they’ll have a bit too much for Inverness and will secure the home win. A lot of people suspected Kilmarnock would be woeful this season and career towards the eventual oblivion of relegation. It might still happen but I don’t think they’re quite ready to be written off. They made Rangers work last week and that’s how I expect Mixu to have them playing week in, week out. They’re not going to roll over die. Motherwell felt somewhat aggrieved in losing to Hibs last week but they really should have made their first half dominance count more. They might enjoy a lot of the ball at Rugby Park but I expect a sting in the Killie tail. A low scoring, but possibly not no scoring, draw. Getting beaten 4-0 by Aberdeen turned the first day of the season into something of an ordeal for Hamilton and Hearts will be hoping the hangover lingers on in this one. It appears that Hearts are going to rely heavily on Kevin Kyle and Stephen Elliot this season and as those two drag themselves into both shape and a renewed partnership a slow start to the season might be expected. I think they’ll have enough to get something here though. Away win. The table topping Dons scored as many penalties last week as they did in the whole of last season. I backed the signing of Paul Hartley as one of the best bits of transfer window dealing but I wasn’t expecting him to kick off in such a bizarre fashion with the lesser spotted spot kick hat-trick. St Johnstone enjoyed a solid opening in the 1-1 draw at Tynecastle. And while Mark McGhee will be looking to build on the momentum, nothing would please Perth more than bringing Aberdeen crashing down to earth. This could actually turn into a right good game. Scoring draw. Last week’s predictions: 3 out of 6. A long punt on Inverness getting a draw failed as they disappeared after the break, Hibs pleasantly surprised me at Motherwell and St Mirren proved they’ve at least got something about them in drawing against Dundee United. Still, I’m not depressed at that start.